Ali Carter had grand plans to escape life's daily grind as he focused on his fight against testicular cancer. One of the world's top snooker players vowed that, if and when he recovered, he would reassess his priorities. Last summer's diagnosis seemed like a life-defining moment. It deserved respect. "When you are diagnosed with cancer, nothing in the world matters other than your health at that point," Carter, 34, told BBC Sport. "And you say to yourself, 'If I get the all-clear, I will have a year or six months off, or go on holiday for three months and I will look at my life and do all these sort of things'. "But when you get healthy again, life doesn't let you do that to a certain extent because you are running with the pack and, all of a sudden, the pack are running without you and you have to catch up again. "The perspective soon changes and that is wrong really." Carter's particular pack comprises his fellow top-16 world ranked players and those trying to break into it. With bills to pay and an increasingly hectic and competitive tour schedule, he feels he cannot afford to drop off the pace. The Chelmsford-based cueman had surgery almost immediately after his diagnosis in June and, within three weeks, was given the all-clear. He said: "I did withdraw from a few events - the ones I had to - but I made sure I was right for Christmas time and after Christmas so I could get myself back in the top 16. I have a family and commitments so I need to go to work, do my job and earn money. "Sometimes the choice is made for you. As much as it would be nice to put your feet up and have a couple of years out, realistically you start thinking to yourself 'I have to get going now'. And while you can maintain being healthy, that is the time to do that." 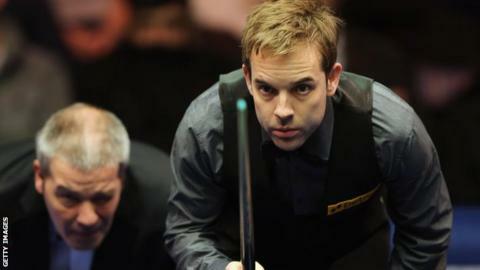 Nine months later, the two-time World Championship finalist is back at Sheffield's Crucible Theatre. His outlook may be different but the world number 11 - twice a runner-up - is focused fully on trying to win snooker's showpiece event. It is almost as if nothing has changed. A year ago, he lost to eventual winner Ronnie O'Sullivan after a slick first-round display against Ben Woollaston, and the man who overcame him in the 2008 and 2012 finals remains the man to beat. But this time, after overcoming Xiao Guodong 10-8 in the first round, it is Mark Selby who Carter faces in the second round. Carter, nicknamed The Captain because he owns a pilot's licence, has also spent the last decade coping with Crohn's disease - an autoimmune disorder that affects the digestive system. But he is quick to gloss over his troubles. "It's been a tough year but it was always my goal to be in the top 16 so I didn't have to qualify and I achieved that," he said. "I have been a bit unfortunate to face Ronnie twice but two finals is a good record here and I have also had a semi-final and a quarter-final. "The only thing left for me to achieve here is to win it. I have had a maximum here. It's all good, but there is just the one more step which is then biggest step to go." A three-time ranking event winner, Carter feels his form is healthy and he relishes playing in Sheffield. The highlight of his Crucible career so far was a sensational maximum break against Peter Ebdon on his way to reaching the 2008 final. The snooker buzz was obvious, but the cash boost was much needed and was playing on his mind as he got closer and closer to completing the break. "As a compact moment - just one frame - it is probably the best feeling of my life when I made the 147 with the pressure I was under," he said. "At the time I was skint as well so I needed the money. It was six years ago; I wasn't doing too well so I was thinking about doing something else for a living. Then that happened, I got to the final and things turned around for me." If he does fulfil his ambition and win a World Championship, the £300,000 prize money will be welcomed, too. But although career breaks, lengthy holidays and massive life changes never quite materialised after last summer's bad news, Carter conveys the strong sense that a cash jackpot will be secondary to the prestige and title.